"There has to be chemistry between the car and the driver, and that's something not even science can guarantee." For some time, I've been a casual Formula 1 racing fan, and awhile back I also used to keep up with NASCAR, though not anymore. I'm actually not much of a sports fan, but there's an interesting lure to high-tech, auto racing. It's a curious marriage between a driver's skill and the massive amount of engineering and science of every inch on the car. I even had the pleasure of going to the last ever (to date) American Formula 1 race, in Phoenix, Arizona. The IMAX documentary, Super Speedway allows the viewer to tag along through some of the elements in a typical race season for Indy Car team Newman-Haas, using Ford engines. One of the team drivers is Michael Andretti, son of revered Mario Andretti, and we see a bit of the effort put into preparing him for a new car, new engine, and new challenges. Part of what makes auto racing doesn't even happen on the track or in front of audiences. Rather, it's all the secretive design and manufacturing of car bodies, engine components, carefully guarded gear ratios, wind-resistance calculations, and other tricks of the trade. Narrated by actor Paul Newman, co-owner of the Newman-Haas team, the documentary sheds some light on these complex preparations that go into a car, all before the driver even gets a taste of what the vehicle is capable of. Here, we see how the Andretti's get into gear for fierce competition. Like any good documentary, Super Speedway knows where to take itself seriously, where to insert some humor, and where to show that it's not all fast speeds and glory. Of course, what would an IMAX movie about racing be without some outstanding race footage, and we certainly get it. Closely collaborating with the Newman-Haas team, the filmmakers developed special rigs to attach the huge, cumbersome IMAX cameras to Indy Cars without it adding significant problems to driving. The technical achievement is impressive, and the general level of respect shown to the sport is admirable. You ride with the drivers in a nice presentation of sound and fury, giving a slight taste of what it must be like to be immersed in a deafening, super-fast vehicle for a few hours. Focusing on the Andretti family was a good choice, too. Not only do they have quite an impressive lineage in the sport, but they're also one of most agreeable figures in the sport—never cocky or prone to wild boasting. There's been a lot of movies made about the auto racing world, most of which have been, in my opinion, terrible. While this isn't a fictional film, it's certainly 50 minutes of solid documentary with flair and excitement attached to it. Better yet, it's real; without need to be legitimized by Hollywood stars or flashy special effects. I guess that's why it's such solid, honest entertainment. Now, if only someone would do a similar documentary with Formula 1, then I'd be in heaven. Image Transfer Review: Both widescreen and full-frame versions of the film are visually outstanding. A wealth of sharp, clear details can be easily seen, and neither digital flaws nor print problems interfere. Colors are glowing and brilliant, without bleeding, and no artifacts or movement can be detected. Anamorphic enhancement on the widescreen version has not added any significant aliasing, and the transfer is very smooth. This is near demo quality in my opinion, an outstanding image in every way. That said, though, there is room for just a hair of improvement, I think, but that's a technical issue. You will be satisfied either way. There is some confusion, though, over the real aspect ratio of the film since it was filmed in IMAX, yet presented in a widescreened 1:85:1 version. After a lot of observation and physical measurements, I determined that the widescreen version does indeed carry more picture on the sides of the frame compared to the full-frame, so the process by which the IMAX print was cropped onto DVD escapes me, but I would personally recommend the widescreen version. Audio Transfer Review: Along with superb visuals, the disc features incredible Dolby Digital and DTS 5.1 mixes that are truly worthy of the term "demonstration material." Virtually every scene uses a complete surround field to create one of the most immersive mixes I've ever heard. Of course, where the sound really counts is the racing sequences, which are most impressive. Liberal usage of all the channels puts you in the driver seat as Indy Cars race around the track, twisting and passing each other in the heat of competition. When a scene changes to trackside, the audio re-creates the experience of actually sitting in the middle of a race by having the whine of cars circle all around you. Having been to a few races, this sound mix is 100% spot on. You can practically feel the rush of wind during the sequences where the camera is attached to the rear wings or side wings. This said, there is very little difference between the Dolby and DTS mixes. The only improvement in the DTS version is that the surround effects are slightly more seamless between back and front speakers, and the more subtle sound effects hung in the air slightly more realistically. The only thing that could have possibly improved the mix would have been even more racing scenes. It should be noted that the widescreen version of the film has only English DTS and DD soundtracks. The Full-frame version has English, French, and Spanish DD, but no DTS. 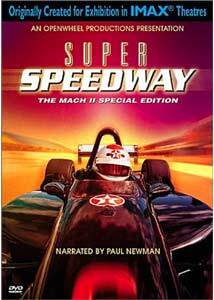 Extras Review: An improvement on the original version of Super Speedway, this Mach II Special Edition features the new widescreen version as well as a 47-minute making-of piece. The making-of movie is very well made and elaborates on the process that went into creating the film, including footage of the cars driving with the actual IMAX rigs, as well as the process of the special hookups. Interviews with the director and crew are featured, as well as in depth interviews with the Andretti's about their participation. The actual film and the making-of compliment each other making a nice double feature. The only other real feature is a short 5-minute reel of unused racing footage. It is accompanied by an impressive Dolby 5.1 sound mix. While both central features have a lot of chapter stops, only some of them are available through the chapter selection menus. The keepcase insert indicates which chapters are menu-selectable and which aren't. Super Speedway is a fantastic DVD in both terms of quality and it's entertainment value. It showcases the potential of the medium in a very honorable way and adds up to a spectacular documentary for racing fans, especially Indy Car ones. Definitely worth a look.